Yes, my cousin gave me my first Long Champ bag. Actually, it has been like 4 years since I've known this brand of bag. It's just that I'm not that fond of them because I find the bags so plain for my taste. 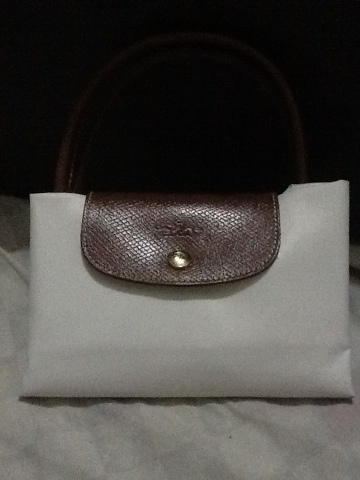 Now that I have one, I find them very light unlike some of my bags which are heavy. I'm beginning to like them a lot now. I've been sick for a couple of days now...and my christmas gift list is not yet done. All malls near our place are all crowded like it needs crowd control products specially when it comes to paying at the cashier. Because of christmas rush, people are all over the place like you don't know anymore where the line starts. I swear, malls need velvet rope or stanchions per counter so that shoppers will be in one or two lines going to the cashier. Oh, don't ask me about the traffic... Traffic enforcers needs barricades I tell you...alot of unruly drivers nowadays. That makes me hate driving. Please visit my other blog, Live it Up... as I am poor in multi-tasking when it comes to managing blogs. Wanna be the next Tyra Banks? I do. Look Of The Year are looking for people from all over the world to send in their best pictures so use this chance to be the next model working in Paris, New York or Milan. An online beauty contest for anybody – not just a chosen few, but everybody who wants to join! And the judges? Not some secret group but simply everybody who surfs http://www.lookoftheyear.com onto and votes. That could be ME or YOU! Join Look of the Year today and start your new life together with beautiful people from all over the world. *Sigh*...I guess it's my fault why my phone got busted. As what I've wrote on my other blog, cellphones are really should not be over charge. Haaay. Yep, thanks to Nova. I got my own domain already just awhile back. It's still very raw, I still have to finish updating everything there. If you visit this now, it will redirect you to my domain. I have to wait for 3 days for it to be official on the web. Anyways, I'm so happy that I got my OWN already. Wish to see you all there. I'm gonna be busy for days now (due to my new blog). I need to bloghop and let everyone know about it. Yipee. For the past few weeks, I'm still contemplating whether or not to get my own domain. I'm not that sure if I can always blog for life. Like this My So-called Life, this is my first ever blog where I can feature everything about me, It's my other blog that I sometimes neglect to update. One thing that's holding me back is that I don't know much about computers (rss, html codes, feeds, etc...).That's why nowadays, I keep on bugging Eds and Nova to help me out in finding a user-friendly domain/website for me. Kung hindi, maloloka ako. LoL. 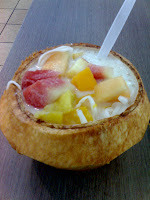 Maybe when I find one which is suitable for me, I'd give up one of my blogs and just maintain two. Three blogs is too much for me to handle (that is if I'll get my own domain). Any help from you guys? Due to my high cholesterol level, my mom always cooks healthy food for me now. 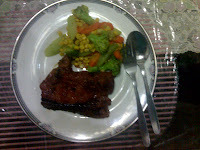 Last night we had grilled barbecue pork chop with buttered vegetables (corn,carrots, broccoli, sayote). 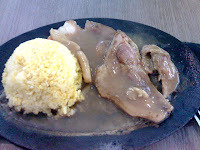 She called her menu last night as Grilled pork chop ala Beth. Lol. Not good. My SGPT and SGOT is still high as well as my cholesterol. My ultrasound result is not good either. My liver is larger by 2cm than the normal size. Now, I'm under medication. My doctor, Dr. Aristides Panlilio, gave me something to take for my liver. He's suppose to give me for my cholesterol to make it lower but it he said it will surely interfere on my liver medications. That's whe he told me to limit my fatty food intake na lang. My next check up will still be on June. Hope to get a positive result next time. To give you an idea, the reference range for SGOT and SGPT is 0.00-32.00 U/L... 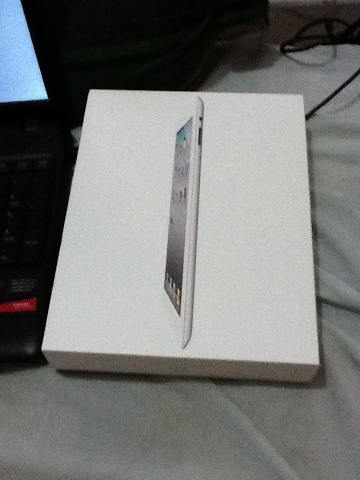 Guess what I've got? 272.24 for SGOT and 348.23 for SGPT. Kinda high---rather, very high! SGOT and SGPT is an enzyme that is normally present in liver and heart cells. SGPT/SGOT is released into blood when the liver or heart are damaged. The blood SGPT/SGOT levels are thus elevated with liver damage (for example, from viral hepatitis) or with an insult to the heart. Some medications can also raise SGPT/SGOT levels. Also called alanine aminotransferase (ALT). I have to go back tomorrow for my result at the hospital hoping for a good result. Otherwise, I'm going to go under medication. Huhuhu. 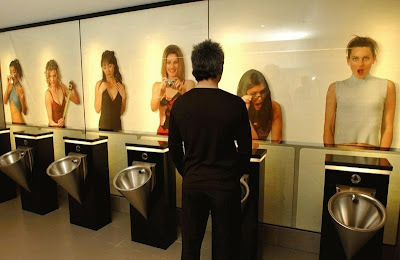 Wouldn't you love to see if Men's comfort rooms are all like these? This is NOT a PAID POST. I got this email from a friend. I checked with Norton Anti-Virus, and they are gearing up for this virus. I checked Snopes (URL above), and it is for real!! You should be alert during the next few days. Do not open any message with an attachment entitled 'POSTCARD,' regardless of who sent it to you. It is a virus which opens A POSTCARD IMAGE, which 'burns' the whole hard disc C of your computer. This virus will be received from someone who has your e-mail address in his/her contact list. This is the reason why you need to send this e-mail to all your contacts It is better to receive this message 25 times than to receive the virus and open it. If you receive a mail called' POSTCARD,' even though sent to you by a friend, do not open it! Shut down your computer immediately. This is the worst virus announced by CNN. It has been classified by Microsoft as the most destructive virus ever. This virus was discovered by McAfee yesterday, and there is no repair yet for this kind of virus. This virus simply destroys the Zero Sector of the Hard Disc, where the vital information is kept. What the ....! Well, at least I am kinda smarter than a 5th grader. I never thought I would get below 50% ! You are 40% Smarter than a fifth grader. Retake fifth grade and try again. maybe now that you lost your bribe money you'll try to better instead of playing pac man. Thanks Lira & Macy for this tag. BUSY PEOPLE: 1.) my chopsuey 2.) mind bubbles 3.) vanity kit 4.) somethingpurple 5.) a detour 6.) Confessions of a Supermodel Wannabe 7.) Mitch of When Silence Speaks 8.) Hailey's Domain9. Hailey's Beats and Bits 10. Air Sick 11. Avee's Adventures 12. Never Ending Stories 13. Essay of Life 14. Tasteful Voyage 15. A mom's note 16. Food Blog 17. Jean's My So-called Life 18. You're Next! Come and play along Nova, Deliciosa, CC, AngelNoah & Bless. ...but I missed it. Boohoo. I got 3 missed calls from the company I'm telling you here. I left my phone inside my locker and when I checked it during my lunch break, I saw that I got some missed calls. I saw that the first call was made 10:32am, the second call was made 10:40am and the last one was made 10:57am. Guess what time I went down our building to have my lunch break? 11:05am! My gawd, is this a sign that I'm really not for that company? Huhuhu. My mom loves candles specially the scented ones. My Aunt Cathy from US sent me a couple before and guess who often uses them? My mom!